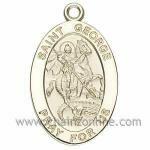 St. George is the patron saint of boy scouts, England, farmers and soldiers. 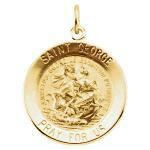 We know with certainty very little about the life of Saint George. As the legend goes, there was a small town in Libya called Sylene. It was in a swamp near that city that a ferocious beast lived. The villagers were at the mercy of this dragon and unless they kept it constantly fed, it would ravage the town. So insatiable was the appetite of this creature, that the town's entire livestock had eventually been depleted, leaving only the townsfolk as a food source. The town, in fear of this creature, drew lots for the sacrifice. 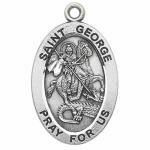 A young Cappadocian knight named George was riding through Libya where he came upon the city just when the king's daughter had drawn the unfortunate lot. This young soldier made a deal with the king that he would slay the dragon in exchange for the entire town's conversion to Christianity. The king was quick to agree, not thinking that this young soldier had much of a chance; if nothing else, it would delay the inevitable with his beloved daughter. 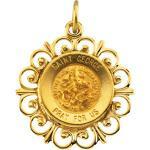 George was good to his word, slaying the dragon by lance. So too was the town good to their promise, as some fifteen-thousand were baptized. 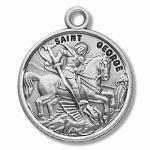 Later in life, as the legend goes, Saint George defied a Roman Emperor who demanded that all Christian clergy make sacrifices to pagan gods. 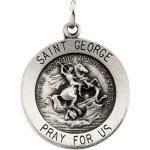 For this public defiance, Saint George was thrown into a dungeon, tortured and martyred around the year 304 A.D.